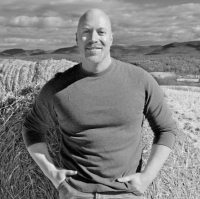 Drew Rozell, Ph.D. partners with dynamic individuals, groups, and progressive companies who wish to to create more freedom, ease, and connection in their lives and businesses. Yes indeed. Big news from the homefront. The ultrasound image tells the story. Karin and I are expecting our first child at the end of the summer. Words do not allow me to capture the depth of my feelings, so let’s just say we’re thrilled. More related thoughts in this month’s feature. A few more births around here as well. 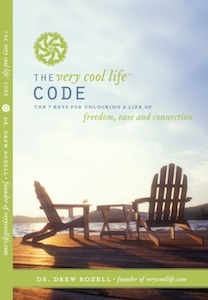 Super stoked to report that I have finished my book, Very Cool Life! After investing in a coach, after years of stop and start, push and pull, I cranked this puppy out in two months. What’s more, I know the information in there is solid and written in an entertaining way. Look for the big launch at the end of the summer. In coaching news, if you are looking for the proper (and necessary) support for creating your own version of a Very Cool Life, I am pleased to announce a few new options. First, I am now offering Very Cool Life Breakthrough days — both in-person and virtually (over the phone). I recommend these for people who are ready to get aligned FAST and have an unforgettable experience at the same time. In person days are held at a very cool Vermont inn or camping lakeside in the mountains with yours truly. Your choice. Second, my wife and I have been teaming up for solo business owners who want the full enchilada — a powerful brand, compelling message, and a clear mind. 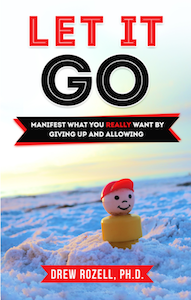 Karin does the step-by-step marketing piece and I do the aligning of the mindset work. This program is a combo of in-person work (come see us) and follow up coaching. We have two spaces left. If you are interesting in connecting, the first thing to do is to schedule a session with me to see how it feels when we connect. Finally, you might enjoy some of my recent posts, including my 3-part essay on a wild kayak ride with my friend. I hope you find my thoughts valuable. So, I am going to be a father. A dad. Someone’s old man. Karin has been showing for a couple months now (she’s due at the end of the summer). I’ve found that our good news evokes two distinct reactions from people. Members of the first group of people tell you how happy they are for you. They tell you that they believe the two of you will be wonderful parents. At some point, these people are likely to hug you. The second group of people responds in a much different way. Before expressing any sort of joy, these folks project their parenting experience onto you. They tell stories about how relieved they are to have survived. “You have no idea what changes you’re in for,” one person told me, his tone reflecting his pity regarding my naivety. “You are absolutely right. I have no idea what to expect,” I replied. Of course, he was right. When it comes to being a dad, I have no idea of what to expect. However, what I did not bother to tell him was that I hold a clear expectation. My expectation is that my life will get better than it is today (and it’s very cool now). Experiencing the two types of reactions from others has been another clear example of how people hold one of two distinct mindsets. There are CHANGERS and there are EVOLVERS. I’ll start with the CHANGERS. Ask a CHANGER if they understand that life is full of change and they will say yes. However, while they acknowledge that life is full of change, they do not really embrace it. To better illustrate this distinction, picture a surfer bobbing in the ocean with his board. The CHANGER knows the waves are coming. But rather than exerting the effort of paddling with the wave or mastering the skill of popping up on the board, the changer stays put. He lifts the board overhead to use it as a shield from the oncoming barrage of waves. CHANGERS do not have the vision to see beyond the current set of waves; their immediate goal is survival. They just want to let the waves pass over so they can get back to their life as it was. CHANGERS usually muster enough willpower to keep themselves afloat – for a while. But it does not take many waves to discover the true power of the ocean. In the long run, covering up and hoping for the waves to stop is not a winning strategy. You end up a victim of the whims of the ocean. Continuing with this analogy, an EVOLVER decides to use the most powerful tool at his or her disposal (their mindset) for its intended purpose. They use the board to go surfing, dude. The EVOLVER understands that getting on top of the waves is not easy and requires effort. The EVOLVER chooses to focus their thoughts in a clear, positive direction. The EVOLVER knows that the point of life is to grow, to expand, and to improve. The CHANGER has forgotten all this. The CHANGER spends their time dealing with problems. The EVOLVER invests in eliminating problems before they occur. Doing my morning workouts, the trainer offers a few words that reflect the thinking that separates CHANGERS and EVOLVERS. “You can get older. Or you can get better,” he says. He goes on to explain how he can do things in his mid-40s that he could not do in his twenties. So if you’re wondering if you’re a CHANGER or an EVOLVER, consider your answers to the following questions. What are you getting better at right now? What are you actively learning? What steps are you taking to improve the quality of your daily experience? EVOLVERS have clear answers to those questions. CHANGERS tend not to be so forward thinking. Make no mistake, getting better and becoming an EVOLVER requires your consistent focus and effort. However, never lose sight of the real point here. Being an EVOLVER and keeping up with the speed of life is exhilarating, fun, and challenging. It’s the foundation for a very cool life. Becoming an EVOLVER requires you to invest in yourself — hire a mentor, join a community, or attend a workshop. Learn something new about yourself and become more than you are today. In closing, my son will arrive in three months. I have no idea what to expect when I’m expecting. And nothing could make me happier. TAKE YOUR LIFE BY THE HORNS! You say you want it all? … To feel clear, strong, powerful, and aligned? You can hold the best intentions. You can hope. You can dream. But unless you start to do something different than what you are doing now, the chances of you reaching your destiny are, well… slim. Be an EVOLVER, not a CHANGER. Your life is what you make it, so why not make it a VERY COOL LIFE? Let me invite you to book a 30-minute breakthrough session with me. It’s low-risk. Yes, you’ll need to invest a few bucks in yourself. But if you’re not willing to do that for yourself (with me or another coach), how serious are you? I’ll guarantee that within the 30 minutes, I’ll be able to zero in on the biggest block that’s holding you back. My Breakthrough Day with Drew was the best decision I have ever made! As a result of our day, I feel totally energized, clear on my direction, and a newfound sense of freedom! I didn’t know I could be this happy. I highly recommend investing in a day with Drew! You might be surprised too that you could be this happy! BREAKFAST WITH BUDDHA: By Rolland Merullo. Just 50 pages in, but I can tell I like this novel. Easy to read, excited to pick it up. Some great writing too. SHOPCRAFT AS SOULCRAFT: By Matthew Crawford. Crawford makes the point of the value of working with your hands, creating things. While I am a big believer in his point, the writing style is a tad too academic for me. Reminds me more of a dissertation. Find myself skimming. Not picking it up. Too much proving of the point. BACKCAST: FATHERHOOD, FLY-FISHING, AND A RIVER JOURNEY THROUGH THE HEART OF ALASKA: By Lou Ureneck. Picked this up on a whim at the bookstore. A well-written, enjoyable memoir about being a man and a dad. Savored it each night before bed. Farewell, RJD: Rock legend Ronnie James Dio passed this month. I thought enough of him to write this. AIC Returns: Certainly, rock is my genre of choice, the most common soundtrack to my life. Got the opportunity to see Alice In Chains perform locally with my friend Tony last week and they were great. Got their new album, and I must say, it rocks. Haystack Mt., Pawlet, Vermont. A new favorite little hike of mine. Congrats Dad! You are in for the ride of your life! There is nothing like it. I’m soooooooooooo happy for you both. Congratulations to you both. Enjoy the last few months of “freedom” (there will be times when you miss it) and get ready to enjoy parenthood even more. Awesome and awe-inspiring news! You and Karin are going to have the most incredible child — what a gift to share with the world. Congratulations and much love. Great write as usual on Changers and Evolvers, pleased I’m the latter according to the Book of Drew. I had to take my 11-yr-old Boxer-Lab to the vet this morning after finding out last week he had Lymphoma. I needed the positive high-five for having the oompha to do it sooner rather than later when he became even more pitiful than he already had become. A baby will touch you in places you have never felt before; you will be a wonderful dad. Congratulations! You are receiving the most precious gift in the world. I do enjoy reading your Drewsletters. Have a Fantastic day…. Mazel Tov! What fabulous news! Congratulations on your upcoming evolution into parenthood! In my experience, having the first child is generally pretty easy and wonderful. So, you’ve got smooth sailing ahead of you. I hope your experience is pure joy and bliss for you and Karin. Blessings! Congratulations! My grandmother told me when I was pregnant with my first child that, ‘having a baby changes everything’. Indeed it does, and for the better. Warm wishes and blessings to you both as you await the birth of your baby boy! So excited for you both! Parenthood is a never-ending journey. It will “evolve” you into a better you as you learn to see yourself through your child’s eyes. It is the best thing I have ever done for myself – an given me a capacity for love that I didn’t know existed. You will make great parents. No doubt. Congratulations – throwing a ball with your son will be one of the great experiences of your life! It just may take a couple of years. Congratulations Drew! My first response was with an immediate warm smile. Then I was reminded recently listening to Mellen-Thomas Benedict, he said something close to, “It’s easy to live in a cave for 23 years. Try getting married and having kids. That’s a challenge!” He said people like the Dali Lama should be having kids. The point being, I’m sure glad to hear someone of your kindness, evolution and true caring is going to be a father. Yes, life will never be the same. It will get better. I was recently privileged to be given some little parenting handbooks by the truly wicked smart Dr. Mark Brady. His website is http://committedparent.com. He is in awe of the parenting experience & combines neuroscience, behavioural & developmental psychology, a sense of spirit and more. I get his Sunday morning blog posts every week and enjoy them almost as much as the drewsletter. 😉 I think the 2 of you would be on the same page for a lot of things. it is a great responsability bringing this child into the world from you both, lets hope for the sake of other cultures, besides the USA, that your child can be that the new enlightned breed of Americans that will be more selfless in their attitude to the rest of the world. Be he a wonderful soul, and my hope for you both is that there will be a planet for him to see when grows up. A big hearty hug to both you and Karin for undertaking the next evolution of your lives! We are looking forward to welcoming your son into this world, and to hearing about your journey into fatherhood for the years ahead 🙂 To the next generation, Cheers! I’ve seen you being a great dad someday ever since I first met you all those years ago. Hearty congratulations to you both, and to your son on his outstanding choice of parents! As many have said before, Congratulations! Parenting is the hardest job in the world with the best benefits package and the most incredible rewards for a job well done! I’m sure you two will be awesome parents! Being a dad will expand your heart to sizes you never thought possible!